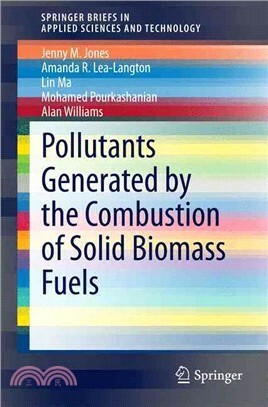 This book considers the pollutants formed by the combustion of solid biomass fuels. The availability and potential use of solid biofuels is first discussed because this is the key to the development of biomass as a source of energy. This is followed by details of the methods used for characterisation of biomass and their classification. The various steps in the combustion mechanisms are given together with a compilation of the kinetic data. The chemical mechanisms for the formation of the pollutants: NOx, smoke and unburned hydrocarbons, SOx, Cl compounds, and particulate metal aerosols are given in detail. Combustion kinetics required for the application for design purposes are given. Examples are given of emission levels of a range different types of combustion equipment. Data is given of NOx, particulates and other pollutant arising from combustion of different fuels in fixed bed combustion, fluidized bed combustion and pulverised biomass combustion and co-firing. Modeling methods including computational fluid dynamics for the various pollutants are outlined. The consequential issues arising from the wide scale use of biomass and future trends are then discussed. In particular the role of carbon capture and storage in large biomass combustion plants is considered as well as the opportunity of reducing the concentration of atmospheric concentration of carbon dioxide.